Minister Columbus Williams began his work as a Pastor in September 1929 under the leadership of the late Overseer Daniel Bostick. Minister Williams was not a licensed minister nor did he ask Bishop Bostick for a church. He obeyed the word of God that was spoken to him saying "Go ye therefore into all the world, and preach the gospel of deliverance from sin." Immediately Minister Williams, his wife, Mrs. Della Williams, his sister-in-law, Mrs. Martha Thompson, and three other women founded the Williams Temple Church of God in Christ in a store front, adjoining a poolroom at 1702 Gratiot Street. Minister Williams, along with the 5 faithful women, fasted and prayed until God began to save in that wicked community. Later the small congregation moved to 1811 Papin Street. It was at this location where Minister Williams became an ordained Elder. His congregation continued to grow. He then moved to 2812 Clark Street; from there to Leffingwell and Bernard Streets. At Leffingwell and Bernard Streets, the Lord wrought many miracles and healings. While still at Leffingwell and Bernard Streets, the Lord gave Pastor and Mother Williams a vision to build the Lord a house. They purchased their first church at 3032 Market Street. The Market Street edifice had a seating capacity of 400 and a membership of 300. In 1963,as a result of the Mill Creek Redevelopment program, the congregation relocated to 5877 Bartmer. It was while on Bartmer Street that Elder Williams was elevated to the position of Bishop of the Second Jurisdiction of the Church of God in Christ Southeast Missouri and Western Illinois. Twenty-four churches were placed under his jurisdiction at the time of his appointment. Bishop Williams knew that the Bartmer Street edifice was too small. He consulted the Lord about another place, several churches in the city were for sale, but none of them fit the description of the vision that Bishop Williams had received from the Lord. One day he passed by the old run down Union Theater Building at 1508 Union Boulevard. Right away he said, "this is it." Through much suffering, sacrifice and praying, Bishop Williams along with his congregation closed the deal on the old theater building. In March 1971, the congregation acquired the building just south of the church which is being used as the educational building. 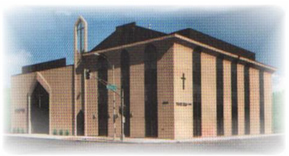 From a humble store front church at 1702 Gratiot Street, with 5 members to the present and eighth (8th) location at 1500 N. Union, (the entire block from Dr. Martin Luther King Drive to Paulian Avenue) Williams Temple Church of God In Christ progressed and prospered both spiritually and naturally for nearly fifty years under the leadership of Pastor and spiritual father, Bishop Columbus Williams. Bishop Williams was called from labor to reward on April 6, 1979. In 1979 upon the death, of Bishop Williams, Elder Lawrence Marcellus Wooten, who had been a faithful supporter and had served as 1st Assistant Pastor to Bishop Williams was appointed Pastor. It was under the pastorage of Pastor Lawrence M. Wooten, that the sanctuary was totally renovated and remodeled into the beautiful house that stands today (the magnificent stained glass window behind the pulpit was designed by Pastor Wooten). Pastor Wooten, PhD, DD., a native Saint Louisan , is an alumnus of Saint Louis University and served as an educator and administrator in the public school system for 30 years.